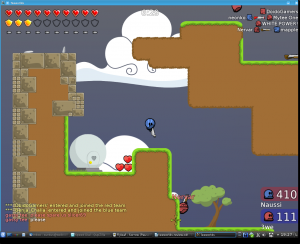 Teeworlds is a retro-style, on-line, multiplayer shooter with a 3-D platforming perspective. Or, to put it another way, try to imagine Super Mario World if all the characters ran really fast and carried guns. When we start Teeworlds we are given a chance to configure the controls, tweak our graphics and audio settings a bit and then given the chance to join one of several on-line arenas. An arena is typically a small, 2-D world made up of a simple maze of platforms. Our tiny avatar is given a pistol and a cartoonish hammer and sent into the world to bash the brains out of anyone who is a different colour than us. Each arena has two teams, a red team and a blue team, and players gain points by destroying other players and capturing the enemy’s flag. At first I didn’t have high hopes for Teeworlds. The retro-style graphics and the on-line only aspect of game play didn’t exactly sing a siren’s song to me. However, I did quickly find myself shipwrecked on Teeworlds shores. The developer of Teeworlds, you see, knew that what makes for a good multiplayer combat experience isn’t high-end graphics or story. What makes multiplayer games fun is the ability to meet people from around the world and get into high-speed, violent clusterphucks with them. Honestly, when I jumped into my first arena, I was worried everyone else would be so far ahead of me in experience that I wouldn’t stand a chance. However, I soon learned a few aspects of Teeworlds work in the newbie’s favour. The first is the maps are relatively large, compared to the size of the character, and this means we enter the game in a small part of a big, open arena. Chances are nobody is going to immediately set upon us with their weapons a-blazin’. The second novice-friendly aspect the game has is that there are very limited weapons. Apart from the pistol and hammer everyone starts with we can pick up a rather clumsy rocket launcher and a shotgun that quickly runs out of ammo. The third benefit newbies have is that the player’s avatar is small and runs really fast. This makes it surprisingly hard to kill another player unless they stick around to duke it out with you. A novice can often run around, picking up weapons and health boosts, staying out of enemy fire and learning the controls. Said controls are fairly simple. There are three movement keys to make us run left, run right and jump. The left mouse button causes our avatar to shoot (or swing its little hammer) and the mouse wheel cycles through available weapons. The right mouse button, I found, fires a grappling hook that we can use to reach high places and swing from the ceiling. In short, the controls are very easy to learn and I soon jumped into the melee, widely firing my gun(s) and trading blows with my foes. What I quickly found was that Teeworlds is fun, a lot of fun. A lot of that is the physics involved. It’s great sport to be able to move quickly, jump, bounce off a wall and jump onto a ledge. Or to swing from the ceiling into a collection of health boosts. It’s good fun to find a rocket launcher and widely fire at anyone or anything that moves. The game is quick, the maps pleasant to explore and I found that much of my first half hour with the game was spent simply running around and discovering parts of the map. Granted, the combat is enjoyable too. Earlier I mentioned that novice users have a good chance to get their feet under them. The player is small and fast, so are the opponents. Combat is tricky business as it involves a lot of running and firing widely at enemies who were there a moment ago. A lot of my kills came from either being one of a group of allies shooting at one enemy or stumbling across a foe who wanted to stand and fight, rather than swing off to another part of the map via their grappling hook. Teeworlds is one of those games where the concept and controls and delightfully simple. The game is very easy to pick up and play. What keeps players (or at least me) coming back is the endless variety available in on-line human vs human games. No two rounds are ever quite the same. Also, there are several maps from which to choose so once we grow accustomed to one arena we can move to another and start learning again. I also like that Teeworlds provides the server-side of the game for everyone. This means we can create our own world and host our own games, inviting friends or setting up LAN parties. Though I haven’t hosted any games yet, I am looking forward to creating a new map and opening it up for people to try and comment on. While Teeworlds may not feature great graphics or a story or even a single-player mode, it is fantastically fun, fast-paced and dynamic. It’s great platforming fun, silly and addictive.